↑ 1.0 1.1 1.2 1.3 1.4 "Villa's plan to rebuild North Stand". Express and Star. 14 मई 2010. पहुँचतिथी 11 November 2010. ↑ "Premier League Handbook Season 2013/14" (PDF). Premier League. पहुँचतिथी 17 August 2013. 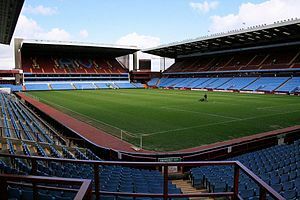 ↑ "Community Shield switched to Villa Park as Wembley hosts Olympics". Daily Telegraph. 18 मई 2012. पहुँचतिथी 1 June 2012.